John Vasconcellos, almost forty years in the California legislature, stood up for humanistic values and a social conscience, spoke out for schools, for children and the disadvantaged, promoted self-esteem and a policy of trust. Vasconcellos understood the importance of art in the mix. He knew my struggles in the early 1980s to form the Euphrat Museum of Art at De Anza College when there was zero money. For decades I had a hand written note from him pinned to the wall by my desk. "If you need anything, call." His "can do" spirit inspired many and lives on in countless lives. Vasconcellos knew that each of us faces difficult and changing situations, difficult communication, and opportunities for growth in our personal and public lives. So for the back cover of FACES in 1984, I juxtaposed a Vasconcellos quote with a detail of Karen Sjoholm's large evocative Woman Secrets, 1980. 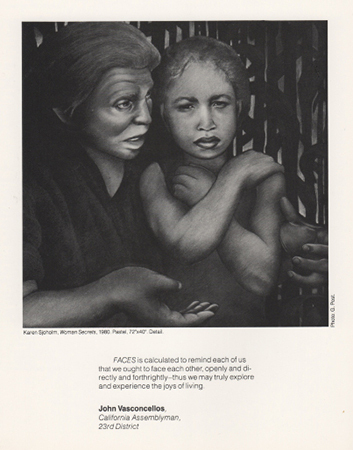 "FACES is calculated to remind each of us that we ought to face each other, openly and directly and forthrightly — thus we may truly explore and experience the joys of living."